From the New York Times bestselling author of Leaving the World comes the brilliant, breathtaking story about a Hollywood screenwriter whose “overnight success” brings about his biggest downfall. Like all screenwriters in Tinsel Town, David Armitage wants to be rich and famous. Finally, after eleven years of disappointment and failure, big-time luck comes his way when one of his scripts is bought for television, making him the new toast of Hollywood as the creator of a smash hit series. I received this book as an ARC earlier this year. I've already read it and I'll be posting my review closer to the release date of April 24. But I will go ahead and tell you it was a great read. Douglas Kennedy is a wonderful storyteller. 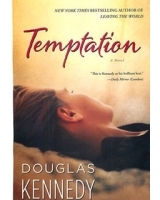 Last week so many people came to my blog to read his guest post from November I thought I would share Temptation as I am sure many of you have it on your waiting list (and if you don't you should). OR, for even bigger rewards, join Lucinda's Literary's Fangelist effort by emailing info(at)lucindaliterary.com. Your help in this grassroots advocacy program for authors can earn you an entire portfolio of Kennedy books. Great! It was different than what I normally read, but very good. I hope you enjoy it.